Use these sources to learn about some of the challenges faced by people serving in different parts of the world. For ideas to help you use these sources, take a look at our Suggested Activities. Trenches were introduced very quickly during the First World War. Trenches provided a very efficient way for soldiers to protect themselves against heavy firepower. 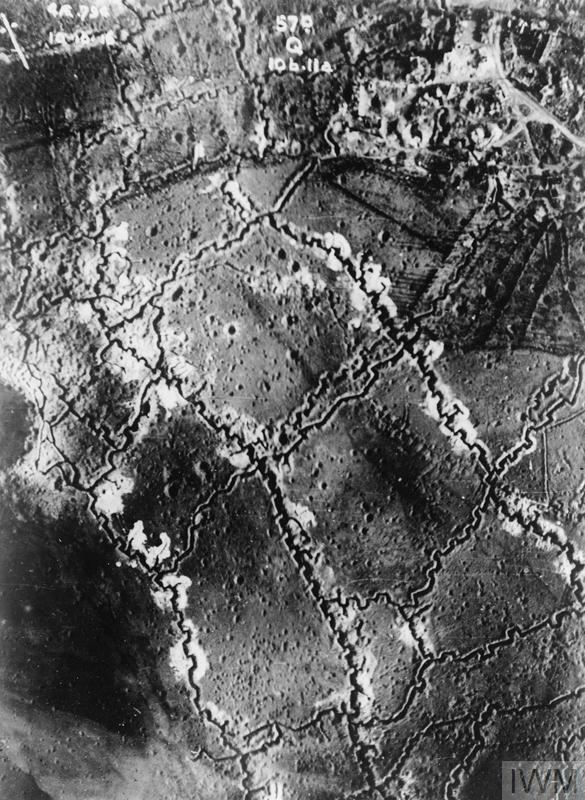 Over time, they developed into elaborate systems like these trenches at Beaumont Hamel, photographed in 1916. 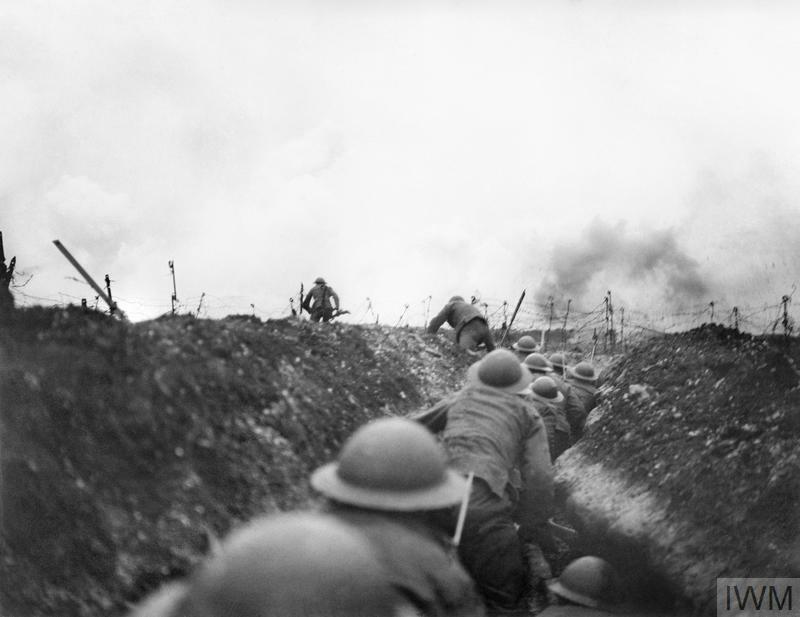 Trench systems included different features, like support trenches and communication trenches, as well as the front line trenches themselves. Trench systems included different features, like support trenches and communication trenches, as well as the front line trenches themselves. 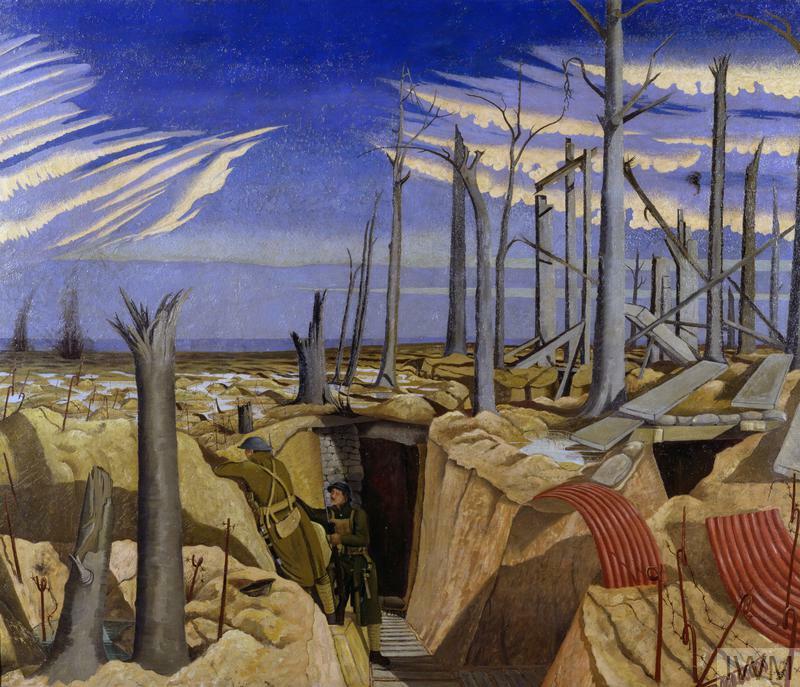 This painting of a trench also shows the area of land between enemy trench systems, known as No Man’s land. Trench systems weren’t confined to the Western Front and were established in a variety of different landscapes across different fronts. 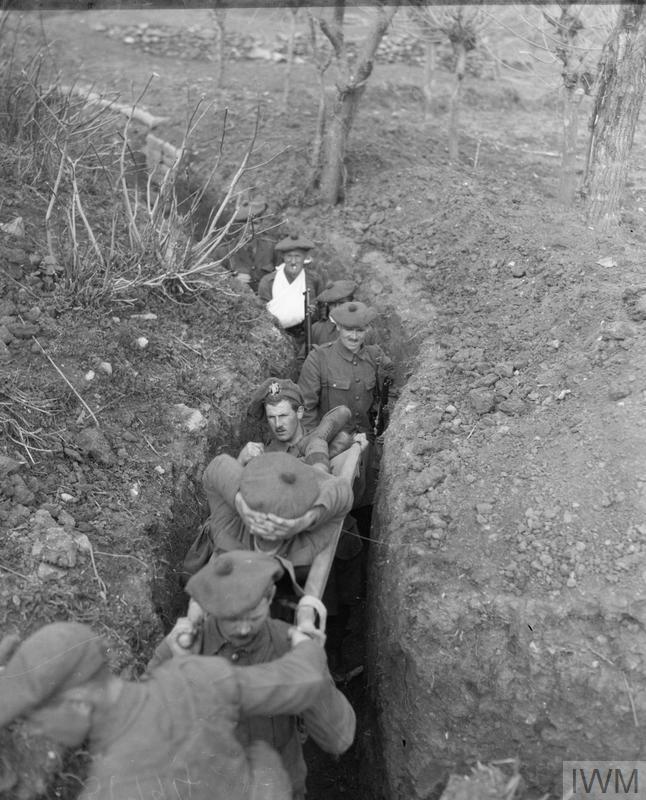 This photograph shows stretcher-bearers carrying an injured man down a narrow communication trench in Salonika. In this area of northern Greece, extremes of climate and the threat of disease led to more casualties than the fighting. 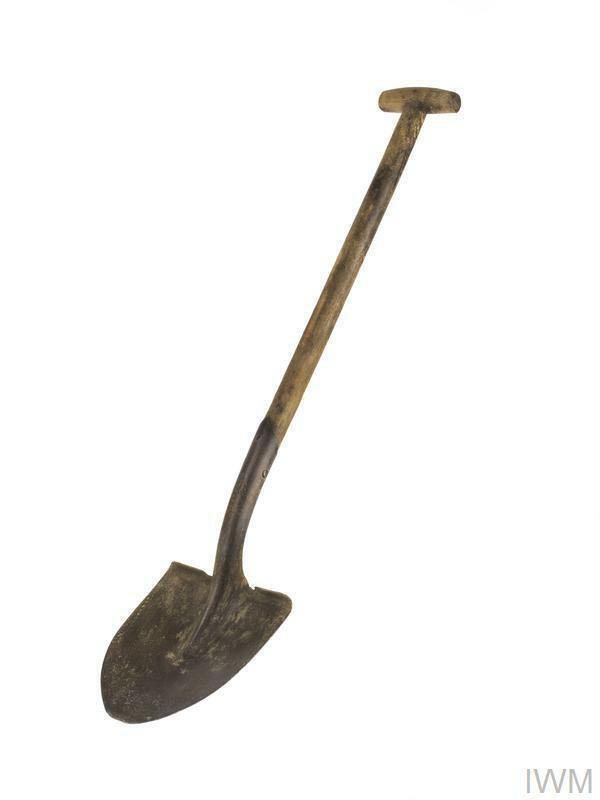 It was essential that soldiers were equipped to deal with conditions in the trenches. These conditions were different depending on where you were fighting, what the weather was, and the time of year. 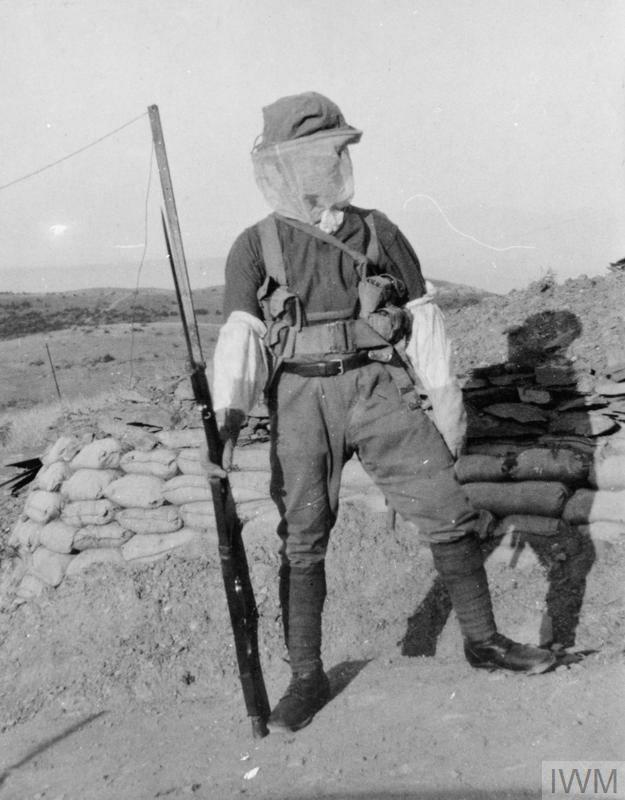 This photograph shows Lance Corporal Harrison wearing protective clothing which was issued to troops on night duty during the summer months in Salonika. 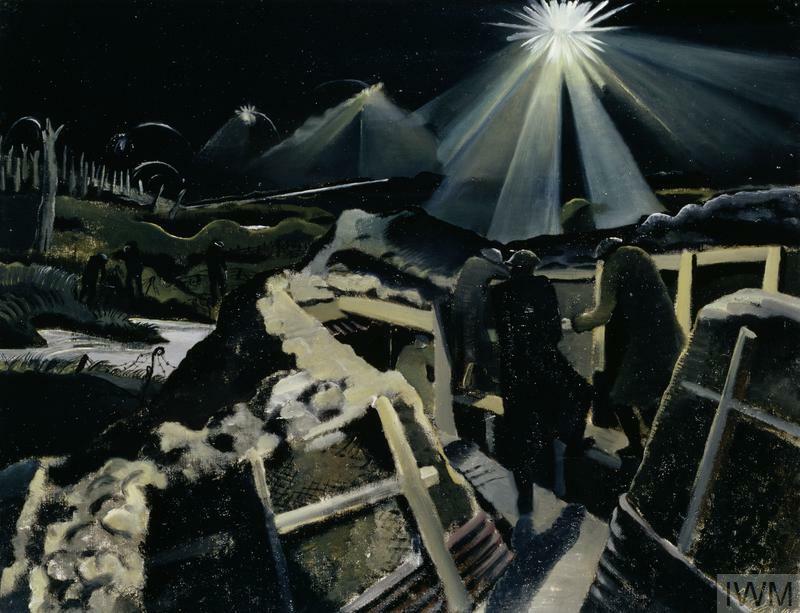 Night time was often the busiest part of the day in the trenches, as it was easier to avoid detection by the enemy. It was the only time to repair your defences and go on patrol across no man’s land, whilst sentries would be on guard throughout the night. Albert Tattersall (sitting down with his arms folded) was born in 1893. He volunteered in 1914 with his brothers John (standing) and Norman (seated). Albert came from Moston in Manchester and served with the Manchester Regiment (5th City Pals). © IWM (Documents.15774) Applies to papers written by Tattersall and his family only. In this letter home Albert describes life in the trenches. These cigarettes belonged to Albert Tattersall. Cigarettes were an important part of life in the trenches, and were given to soldiers as part of their rations. If you didn’t smoke yourself they could be swapped and traded for other goods. Albert’s cigarettes were sent home after he died of wounds received on the first day of the Battle of the Somme. Food was an important part of the daily routine and Biscuits like this one were part of the rations given to soldiers in the British Army. They were infamous for being tough and hard to eat and were often crumbled or mixed with water to make them more edible. 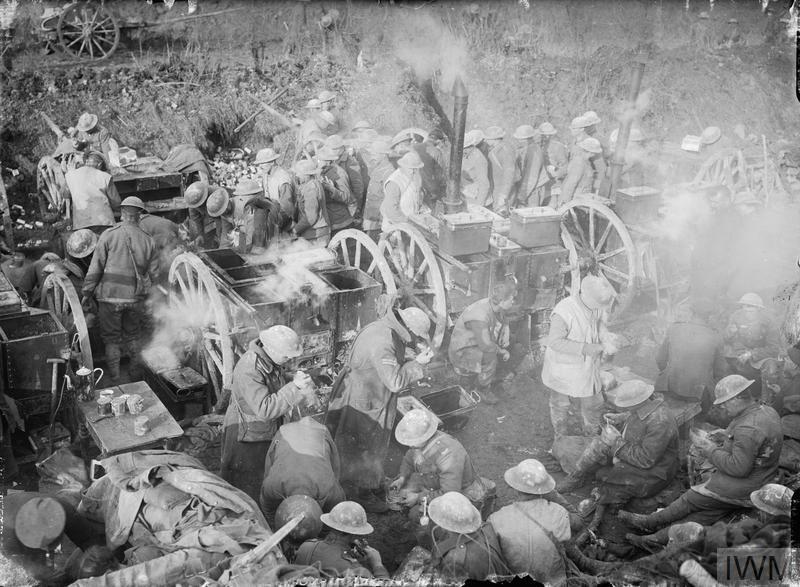 Hot food was not supplied to front line soldiers until late 1915, but even then kitchens could not always get close enough to provide a hot meal for all soldiers. Troops in the front line often endured a repetitive diet of cold tinned food. A unit would spend a few days in the front line, followed by periods in reserve and rest. 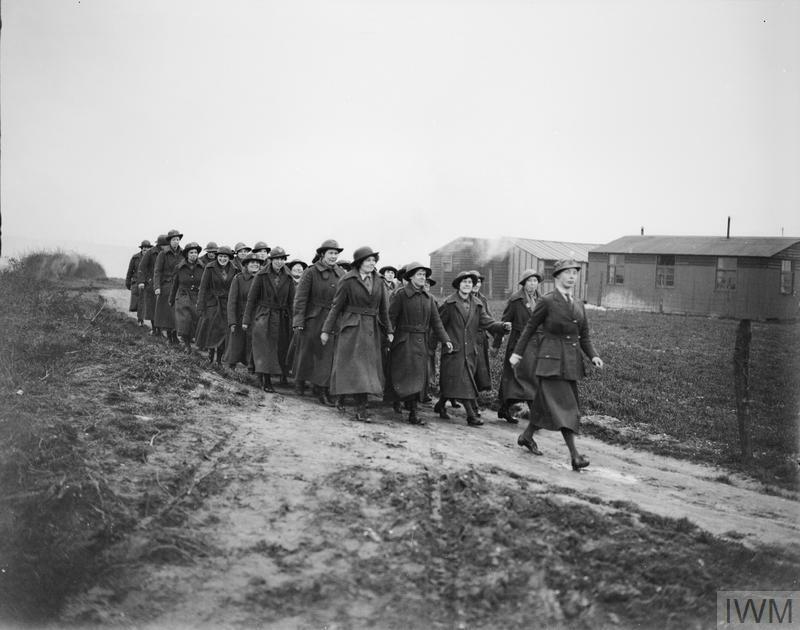 The Women’s Army Auxiliary Corps (WAAC) was formed to carry out essential non-combatant tasks, so that more soldiers could be freed up for service in the front line. The first party of 14 women arrived on the Western Front in March 1917 and eventually, 9,000 women served with the unit in France. Men from China were recruited by the British Government from 1916 onwards to perform support work and manual labour as the Chinese Labour Corps. These duties included digging and maintaining trenches. 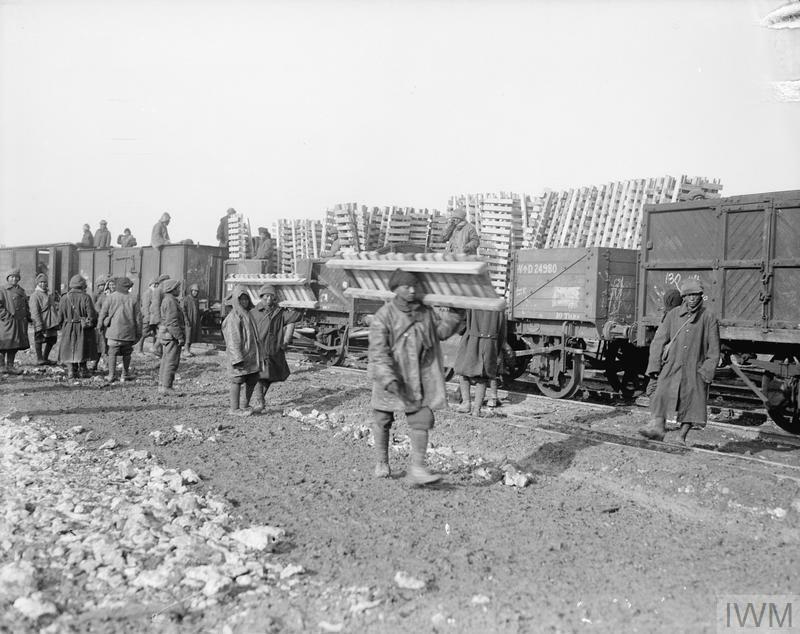 In this photograph men can be seen unloading duck boards from a train. This is one of the few photographs which shows the moment of an attack. It shows an officer of the Scottish Rifles leading his men out of a trench for a raid on German trenches near Arras on 24 March 1917. Soldiers faced many dangers in the trenches, but most casualties on the Western Front were caused by artillery shells, explosions and shrapnel. The German army introduced this type of steel helmet in 1916 to help protect soldiers from head injuries and you can see an impact dent where this helmet has been struck.